The sale prices for New Zealand logs in China remains stable. 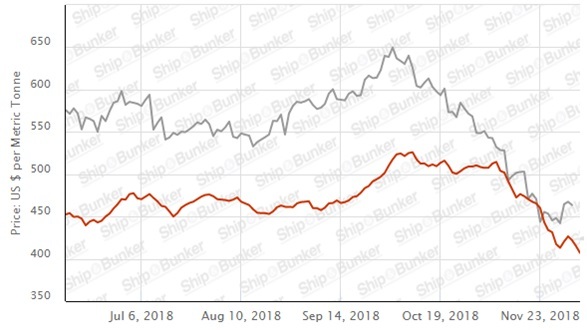 Ocean freight costs have reduced by $2-3 USD per JASm3, but the strengthening of the NZD against the USD more than offset the gains from the reduction in shipping costs. The overall result was an average $5 NZD per JASm3 reduction in December At Wharf Gate (AWG) prices offered at ports around New Zealand for export logs. Some mills have seen a recent increase in demand for timber but are unsure if this is a market improvement or simply a pre-Christmas rush. Clear sawn timber sales in Europe continue to be the stellar export performer for New Zealand mills in 2018. 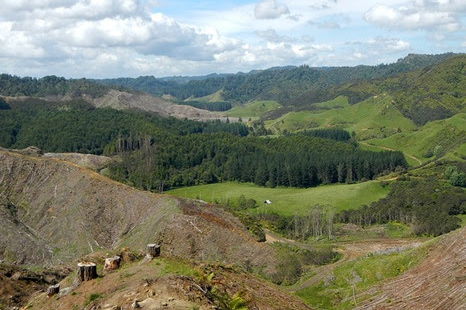 The October 12-month value of New Zealand’s sawn timber exports totalled 938 million while the value of logs exported totalled 3,649 million. These values for sawn timber and logs are 11% and 28% increases respectively from the previous October 12-month period. 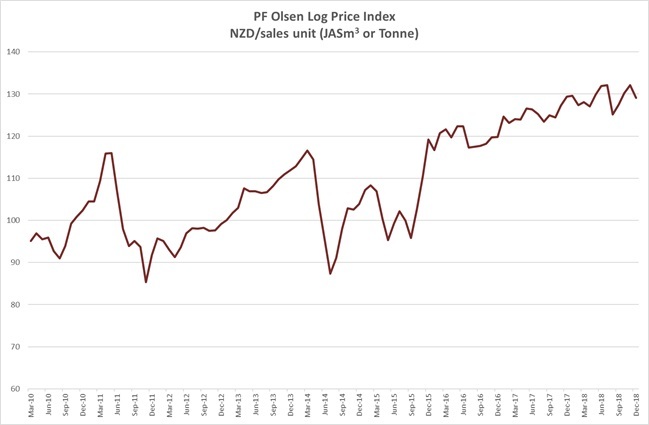 Due to the decrease in AWG sale prices the PF Olsen Log Price Index decreased $3 to $129 for December. The index is currently $2 above the two-year average, $4 above the three-year average, and $13 higher than the five-year average. Most mills reported balanced supply despite some very wet weather around the country. Prices remain constant as we move through Quarter 4. The domestic demand for logs remains stable and balanced, and all mills and log suppliers have now locked in their plans for a controlled reduction in log purchases up till the Christmas break. Most wood processors refer to the domestic market as balanced. While some mills have seen a recent increase in demand for timber this may be due to market share changes or pre-Christmas buying, so overall there has been little change in domestic demand for sawn timber. The New Zealand mills are now planning for 2019, and most mills predict an increase in domestic demand for 2019. Most mills also planned for increased demand in 2018 though. The value of New Zealand’s sawn timber exports increased 11% for the 12-month October period over the corresponding previous period. Total values are up for all export markets when compared to the previous 12-month period. Prices and demand for knotty sawn timber have dropped in Australia, but this is from a relatively high base, so is not a major cause for concern. Conversely, there are concerns of a construction slowdown in Australia with a potential tightening of finance for homes as a result of the royal banking commission. 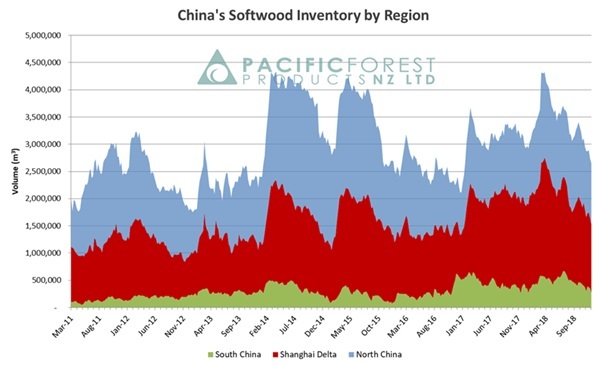 Asia will take as much knotty timber volume as New Zealand mills can send, but these sales are more price dependent. Europe in particular continue to have strong demand for clear sawn timber. These markets have been strong all year. Initially Radiata pine sales to the US targeted replacement of high-grade Ponderosa pine in the mouldings and millwork sector. 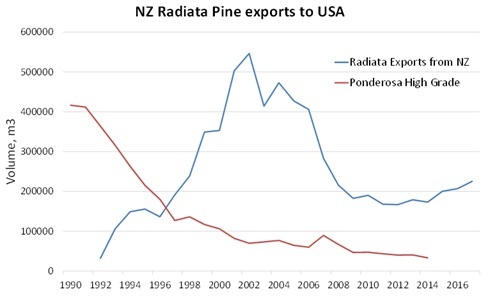 As the availability of US Ponderosa pine decreased, demand for Radiata pine increased, resulting in very large volumes being supplied by many NZ companies through the late 1990s and early 2000s . Initially NZ producers supplied moulding and shop grades of lumber to manufacturers, and solid lineal mouldings to distributors. These sales were significantly affected by the global financial crisis. Solid lineal mouldings have been substituted to a high degree by increased use of primed finger-joint, and MDF mouldings, affecting both high grade lumber as well as mouldings sales. Also higher volumes of imported softwood lumber and manufactured products from Chile, Brazil, Argentina and Uruguay reduced demand for some radiata product – particularly lower grades and finger-jointed products. NZ Clear pine boards established a steady demand in the DIY sector and with Prodealers. After the major drop in supply with the GFC through 2009, it was 2012 before NZ exports of solid wood products to the US started to increase, with steady growth in moulding and shop lumber and clear pine boards, and steady supply of treated exterior products since then. The strong demand for radiata clear sawntimber in Europe is driven by the increase in wood modification processes. In Europe, initially NZ radiata pine lumber exports were largely to Spain. But starting in early-mid 2000s radiata pine lumber started to be used for wood modification, initially for trials and process development, followed by small regular shipments commencing around 2006, and larger volumes from 2010-2012 onwards to multiple companies. New Zealand radiata pine is a preferred species for wood modification for several reasons. New Zealand radiata accepts chemical impregnation efficiently. It is mainly sapwood and there is also less contrast between early wood and late wood than other species, so achieves consistent modification. Radiata has lower density than competing species like southern yellow pine which leads to a saving of 20% on chemical requirements. Radiata from NZ is available in wide, thick, long length clears and is sustainable with FSC certification. Significant growth in demand expected is from all modified wood companies. Accsys (acetylation) and Kebony (furfurylation) both increased production capacity in 2018 and have plans for additional capacity in 2020. Thermal modification companies are developing additional uses and opportunities for radiata. Projected radiata volumes for wood modification in Europe. 12,000m3 of clearwood timber equates to about 50,000t of pruned log. The value of New Zealand’s log exports continue to increase with the October 12-month total export value of 3,649 million a 28% increase from the previous 12 months. Coincidentally the increase in sales value to China was the same amount. Log demand is steady with daily port off-take of softwood logs now around 80,000 m3 perday. The log stocks have continued to drop in China and are now approximately 2.65 million m3. Stock levels have reduced all around the country. Most log exporters are hopeful of price increases for January log sales. Price increases are more likely for unpruned logs as demand will likely soften for pruned logs in January. Chinese log buyers won’t want to hold inventory of pruned logs over the Chinese Lunar New Year. The 2019 Chinese Lunar New Year is relatively early, occurring on the 5th of February. As an official public holiday, Chinese people get seven days leave from work between February 4th to 10th. Last month I mentioned that a ban will be imposed on the current practice of fumigating North American logs at Taicang due to concerns about water pollution. (Taicang is an aggregation of four ports just upriver to Shanghai). Taicang and Changshu agreed to extend the period of fumigation for another 1.5 years. This reduced some nervousness about supply amongst Chinese log buyers. Log inventory in Kandla is relatively low, yet some NZ log exporters concerned about LC problems and default issues, have sold logs at 2-3 USD per JASm3 below the expected market price of 154-155 USD per JASm3 for A grade logs. Some of the log buyers continue to have LC limit issues, as their banks have switched to more active trade in southern yellow pine (SYP) logs and SYP/SPF lumber. The Indian rupee (INR) briefly strengthening to Rs70 against the USD and cheaper log stocks at 146-149 USD per JASm3 bought in the last 1-2 months in the Kandla market (still lying with some mills) have caused a downward shift in sawn timber ex-mill prices from Rs490-500 levels to about present day Rs471 levels. However, the revised lower momentum in the exchange rate with INR moving down to Rs71.50 to the USD has caused concern for importer saw mills. Despite this, log exporters feel the sawn timber prices are likely to get back to Rs 491 levels in the next two weeks, and this would support A grade 154 USD per JASm3 levels. 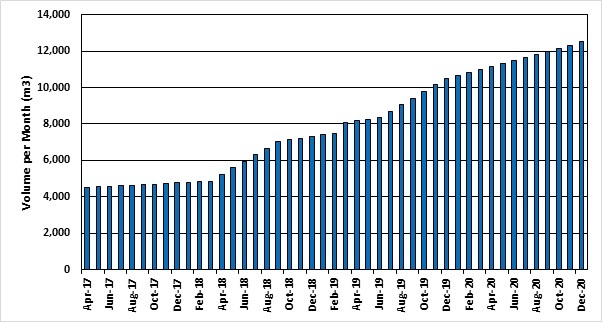 Export market related demand from packaging for exports goods has slowed due to slowing orders for the holiday season. Due to high transport costs, demand from the Delhi construction market is relatively weak. The Indian south log market is equally in a slow mode, though there have not been any price reductions. Lumber sales ex-mill continue at Rs501 to Rs511 levels. The NZ log exporters state this is the weakest market seen in the last decade. They expect increased volumes from January 2019, but there is strong competition between the NZ log exporters to improve their market share. SYP and SPF kiln dried lumber prices (USA/Canada) have moved down from 280 USD levels to 250 USD levels. Log prices for SYP (minimum 10-inch diameter) are at 120 USD per JASm3 and A grade Patola pine from South Africa is selling at 110 USD per JASm3. 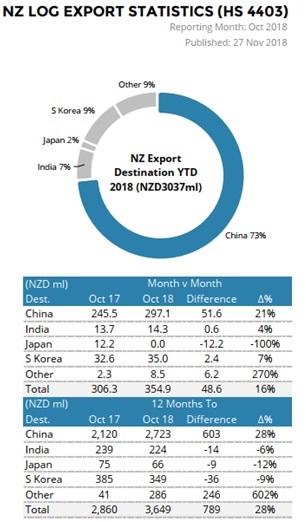 NZ log exports predict the Indian log market would gravitate to A grade 154-155 USD per JASm3 for January 2019 loadings notwithstanding any USA/China trade wars impact. The NZD strengthened against the USD through November and had a significant impact on the December AWG prices offered by export log buyers. 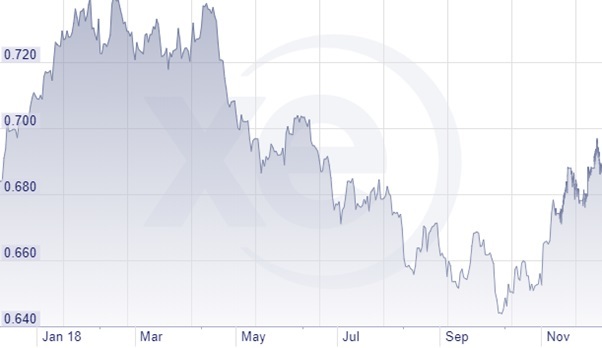 The Chinese Yuan (CNY) continued to stabilise against the USD in November and in early December strengthened against the USD. This has provided some assurance to the Chinese log buyers. Ocean freight shipping costs reduced by 1-2 USD per JASm3 for December charted vessels. 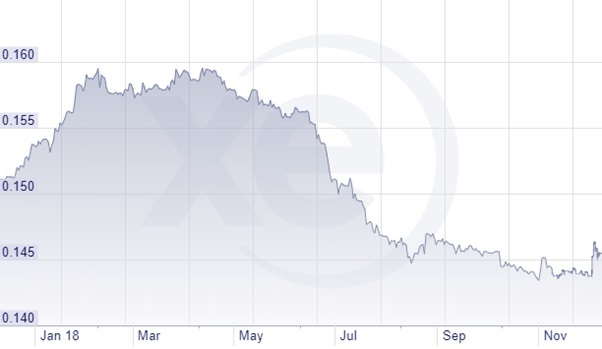 The reduction in oil prices has seen a fall in the bunker prices. The price of oil recorded its biggest drop in almost two years when the International Energy Agency reduced its forecast for demand for 2019. The benchmark US crude on the New York Mercantile Exchange fell 4.5% to close at its lowest price since 2012 of $81.84 a barrel. OPEC and its partners have agreed to reduce crude oil output by 1.2 million barrels per day and this is expected to return the world oil markets to balance. The graph below shows the recent BDI volatility. Note: Actual prices will vary according to regional supply/demand balances, varying cost structures and grade variation. These prices should be used as a guide only..
A longer series of these prices is available here . This article  is reproduced from PF Olsen's Wood Matters , with permission.